This is a birthday card I sent to my brother in law last month. It was one sheet of double sided paper I found at Dee's scrapbooks in Ft. Myers when I was there in February. I can't remember the manufacturer, and I've never seen it since. The front side is the owls hiding in the trees and the back side is covered in owls. 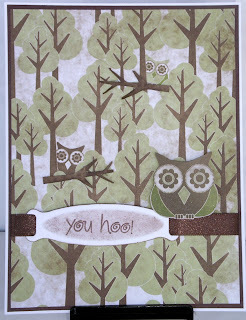 I cut out some trees for branches and added them under the hiding owls and cut out an owl and popped up on a ribbon branch. Sentiment is from Hero Arts.